Please feel free to attend the clinic and to share the announcement. Thank you to all that participated in the Gallery Show. A reminder that take-down is scheduled from 5:00 p.m. – 6:00 p.m. on Friday, December 15, 2017. Thanks to all who entered the quarterly Big Cookie competition. Congratulations to Rich Wyllis, Judge’s Choice and Greg Baran People’s Choice for their winning entries with the theme of Smoke. The theme for the next Big Cookie competition in March 2018, is Funny. Starting in March 2018, the award will be a $10 gift card to the Camera Shop. If you do not use the Facebook group, send your entry by email to mmpclansing@gmail.com so that we can post it to the Facebook page. Discussion of the photos, beyond simply liking the picture, is encouraged. Members who post in all 12 months of 2018 will be entered for a gift card drawing at the end of the year. Be sure to visit the MMPC tree at the Festival of Trees at the Turner-Dodge House through December 31, 2017. MMPC has scheduled a Lighthouse Crawl for Sunday January 28, 2018. The backup date, in case the weather does not cooperate, is the following Saturday, February 3, 2018. We will leave 6:00 a.m. Parking will be at the old Gander Mountain store on Marketplace Drive, behind Cracker Barrel. Be sure to bring tripod and ice cleats and boots. MMPC traditionally holds an open house and clinic on January to attract new members. 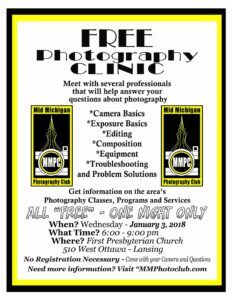 All MMPC members are invited to attend on January 3, 2018 at 6:00 p.m. First Presbyterian Church, 510 W Ottawa St, Lansing, MI. Thanks to Rich Wyllis for taking the group photo at the December meeting.